A place to share a little bit of the history and the beauty of networks with my students. 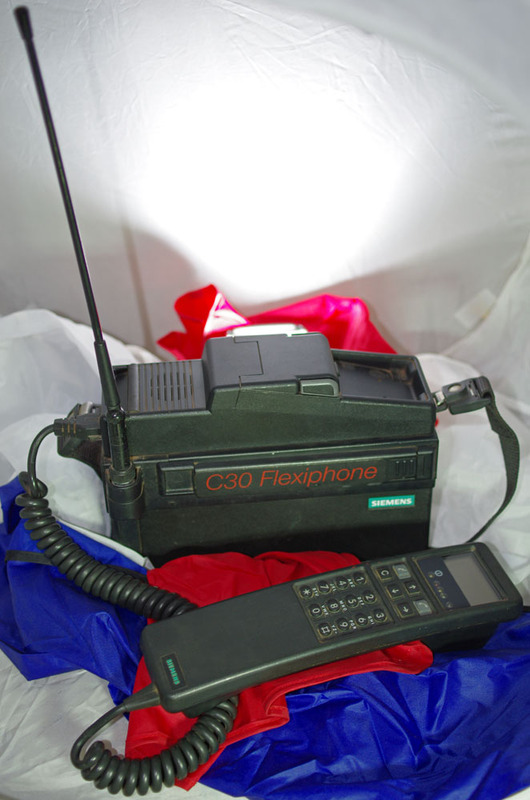 Many people refer to older cellphones as 'brick phones' due to the size of such phones. However, there was a time - in the late 1980s up to about 1990 - when bricks were diminutive in size compared to mobile phones. Those mobile phones were often installed in cars (and therefore were often referred to as car phones). However, many were not permanently affixed to the car and could be carried to wherever they were needed. The lead acid batteries used by those phones were just one of the factors that impacted on their weight. I knew someone who, due to the nature of his work, always carried his phone with him; to be more precise, he hired someone to carry his phone. 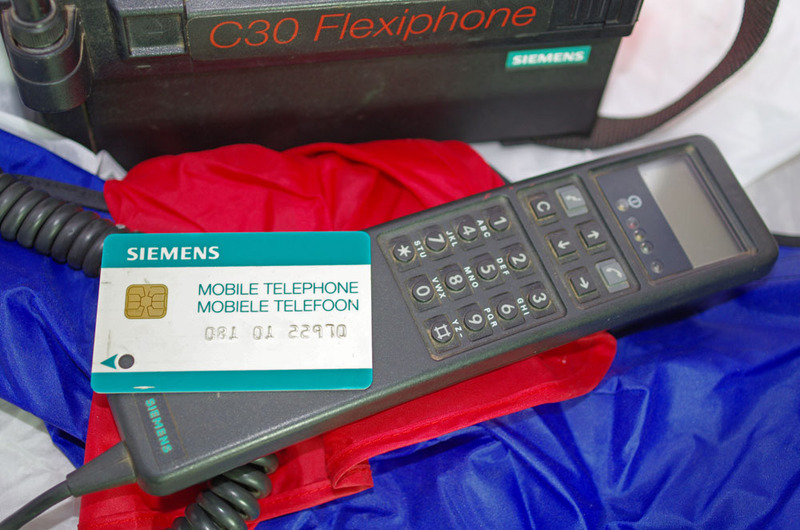 One of the phones dating from this era was the Siemens C30 Flexiphone (circa 1991). The picture above shows the phone as well as a SIM (subscriber identity module) card to be used with it. 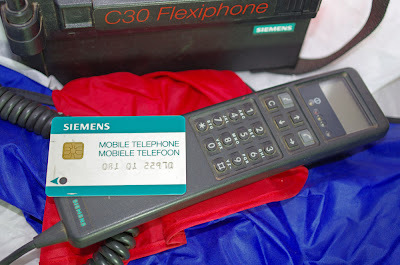 Note the telephone number embossed on the card, starting with a 081; the cellular networks that appeared a few years later initially used 082 (Vodacom) and 083 (MTN). Other operators that arrived somewhat later on the scene continued this trend. However, cellular operators soon needed larger number spaces for their numbers and were assigned other prefixes. Number portability also meant that the prefix was no longer a reliable indicator of the operator associated with the number. The SIM card shown in the picture above was the 'standard' or 'normal' size for SIM cards - the same size as, say, a credit card. 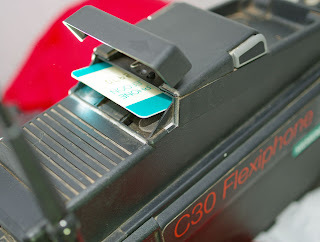 However, even in these early cards the electronics were all located underneath the contact points visible on the surface of the card. Over the years smaller and smaller parts of the SIM card were used by cutting away more and more of the redundant plastic. This lead to the introduction of mini, micro and nano SIM cards, that only differ in the amount of plastic left around the electronics. (However, the electronics evolved independently from the decrease in size of the surrounding plastic by, for example, incorporating more memory as time progressed.) People who have never known 'full size' SIM cards often incorrectly refer to mini-SIM cards as full size cards; however, as demonstrated in the picture below, the 'real full size' cards were indeed once upon a time inserted as is in mobile phones. The logic of using such relatively large SIM cards clearly did not stem from the size of the electronics - which for decades were housed under contacts with a standard size. The relatively large size stemmed from the way subscribers were expected to use mobile phones. The astronomical cost of mobile phones meant that few members of the public would be able to afford a phone. And very few of those who could afford a mobile phone were going to lug it around with them. The much more plausible scenario was that mobile phones could be installed in taxis and at other convenient places. The subscriber then only had to carry a SIM card along and insert it in the phone in the taxi (or elsewhere). The fact that the subscriber could then make calls would have been convenient. However, the fact that it would be possible to phone the subscriber at his or her personal number at the phone containing the SIM made this a must-have tool for busy executives. A credit card sized SIM was the obvious choice for SIM cards to be used in this manner.